Sunday November 17th 1878 I hurried with all my might this morning and so got to go to church. I enjoyed the sermon very much. I hurried home to help with dinner. Winnie was here and staid till after dinner. John Whetstone was here in the afternoon. And Mr & Mrs Custor called. Weather warm and pleasant. Read in the eve. Hatt is no better, she has gathering on her face. We had the doctor in to see her tonight. 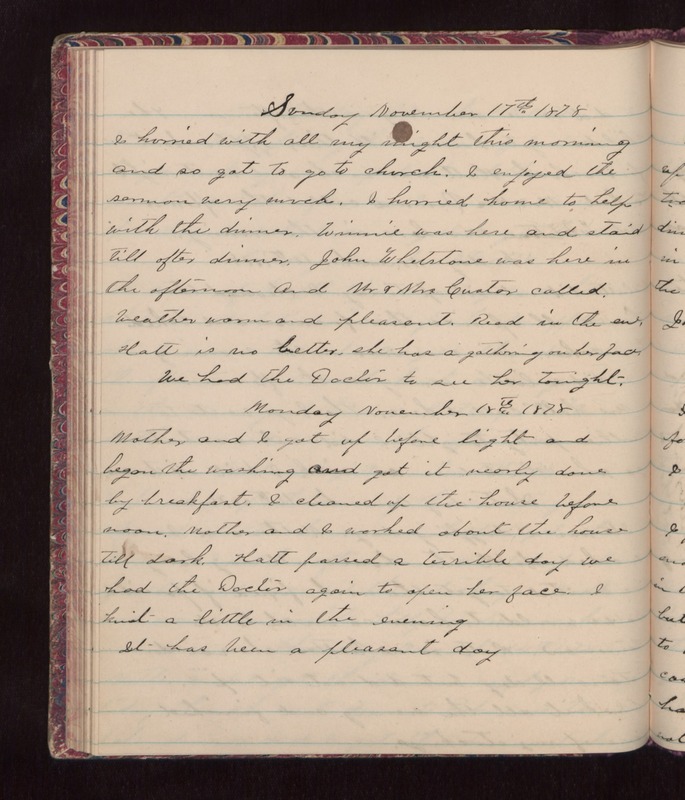 Monday November 18th 1878 Mother and I got up before light and began the washing and got it nearly done by breakfast. I cleaned up the house before noon. Mother and I worked about the house till dark. Hatt passed a terrible day we had the Doctor again to open her face. I knit a little in the evening. It has been a pleasant day.